A slide rail shower is a welcomed addition to most all showers. The most obvious advantage is being able to adjust the height and angle of your shower head to perfectly accommodate every member of the family, tall, short and in-between. No expensive plumbing remodels because your current shower head is too high or too low. A quick shower before going out for the evening no longer means having to worry about getting your hair wet, just lower the shower head. Small children are comfortable starting to shower younger when the showerhead is at the proper height for them. Rinsing soap or shaving cream off your legs is a breeze with the shower head on a hose. 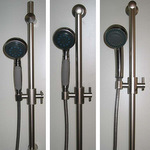 Cleaning and rinsing the shower walls is a piece of cake with a hand held shower head. Easy to install using just ordinary household tools. You can even keep your old shower head and have a dual shower if you want!